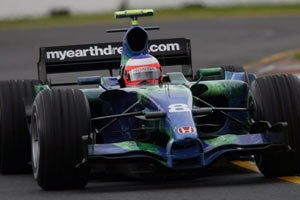 Honda's aim to return to the forefront of racing since their challenges in the 1960's do not come without trouble. After mid-season problems with the RA106, the team presented their RA107 on 25 January 2007. It clearly features a tighter nose and rear end, including an exhaust system that differs visibly from the other teams. The launch itself wasn't a great success as Jenson Button was unable to complete a single lap in the shakedown that same day. Later on, in March, Honda launched their intention to make cars cleaner by starting a green campaign, named myearthdream. After having tested their car with a black testing livery, the car was painted with a map from the earth without sponsorship. Anyone wishing to put their names on the car was allowed to add theirs through the campaign's website.